Can you believe Pop Evil knows about my book? As fate would have it, while on vacation in WI, I was presented with a rare opportunity to attend a POP EVIL show. I hurried to get my ticket the night before to guarantee I’d get in and boy was I surprised the next night. 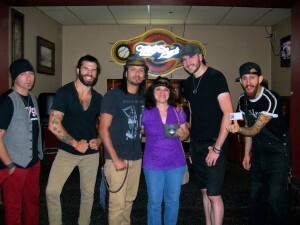 I not only got to see POP EVIL but I was among the first few fans to get a meet and greet with the band. The guys were wonderful as they greeted the row of fans that were awaiting them. They each signed our CD’s, posters, shook hands, gave hugs and made an effort to say something to each fan but the most memorable part for me was having my picture taken with the band. This was something we’d all have as a special memory forever. And even more so for me since I was also able to hand them my information about a book I wrote that has a music theme. They were very supportive and showed interest. It meant the world to me that finally musicians would know about it. After all that is who I dedicated the book to. I hope that POP EVIL finds the time in their busy schedule to read it. But as you can see when I saw the picture up close I realized that Matt was holding my card. That small gesture made this experience even more exciting and personal for me. POP EVIL put on a great, high energy show that evening giving the fans a mix of new and older material. And the smaller venue made the show more intimate. The band was super cool and told the fans to stick around after the show cause they were going to hang out. They really are a nice group of young men and IF they are in your area by all means go check them out. You won’t be disappointed.